Animal ag producer's current decisions to stand up and defend their rights will determine future generation's animal agriculture production and ownership opportunities. Arming ourselves with knowledge and understanding is the key in this defense. This cross section of information from industries being hit by animal activists, is an effort to simplify understanding, and raise awareness of these attacks. Please join in helping secure your family's future. TRUST. Airline, auto and train passengers need it from their transport providers, kids need it from their parents, parents need it from their kids, medical patients need it from their doctors, a country needs it from their leaders...the list goes on. And Cowgirl Chicks need it. They really need it. If you've not seen these girls ride watch the video. They must have complete trust in not only their mount, but their equipment as well. Trust is something I'm having a little trouble with. I'm convinced we have entered an unprecedented time of distrust. It is one of the reasons this blog was started. DISRUST. I've been watching the Nazi Collaborators, if you've not watched this series, you must. Every citizen of the U.S. should take time and watch at least some part of this great series. In each case of collaboration by each individual or group, at the end, no matter how dedicated these men and women were in their justification of joining the "other side"...Hitler's Nazis, the fate of each of these individuals was grim. Several morals to these collaborator stories: "Understand the True Intentions of Those You're Collaborating With", "You Can't Cut Deals with the Devil", "Choose Your Friends Wisely", and above all-"Stand Up for your Country and It's Values, No Matter What". If you've been reading Animal Ag Armed blog it's pretty clear that animal ag producers are under attack from every angle. Gov't rules and regulations, animal and environmental activists. And now are we under attack from within? Are agendas and motives being suggested, that run counter to animal agriculture's values. Like the collaborators who threw in with the Nazis do the carrots being dangled in front of us look so good that we are overlooking the dangers that come from eating them. That they're full of poison. I've been questioning the trust of an individual who has a lot of clout in the ag journalism world, a person whom I've admired for quite some time. An icon in this world where the written word they produce catches and holds the attention of tha ag public. A self confessed liberal journalist on one hand; on the other an individual who reports on the positives of animal ag in one pen stroke, but chronicles diametric views of our industry in the next. Several years ago it became clearly apparant that dualing, conflicting messages were coming from the writings of a certain individual. When FB postings about the safety of our animal proteins and a constant highlighting of undercover videos, it was time to mention my concerns to a state executive. I did but was told to squelch this notion. I voiced my concerns again about an unhealthy focus on negative postings of undercover videos and food safety obsession. When the most recent Butterball under cover video was released this individual was the first that I noticed to post it...once again. It was at this point I decided to question Mr. personally. I put together some questions and he was gracious enough to respond and answer them. I explained my concerns and following are his responses. Agree or disagree- my questions were answered. I disagree with some of Mr. answers and some of my questions were not answered...why the intense focus on food safety? I disagree with Ms. Grandin's stance about video taping, I admire all she has accomplished for the animal ag industries, but at some point business logic must play into these ideas. Ian Duncan, Marler, Adele Douglas all with GAP Connections. But if my horse keeps shying and running off, and questions I have about the enemy go unanswered from my industry leaders, and my cinch keeps snapping, and collaborative relationships with the enemy continue by leaders in the industry, and my bridle keeps slipping and so called "animal ag friendly" journalist whose partial paycheck comes from my pocket, and my bit is in continual need of repair 'll continue to hug the horn.,When I'm told to sweep things I know exist under the carpet, when my concerns are ignored, I won't let go. I'll keep my fingers on the keypad and gather those that speak the truth. p.s. I guess that I hadn't learned about the use of "sustainability" and the triple bottom line as a tool of destruction. I don't believe I realized that connection until I met Janet Thompson. Some of the links may be broken but I will try and fix them. As I try to connect more dots and make more sense of what is happening in the animal ag world, I will be darting all over the place and that may get on your nerves. Sorry, but that's what the enemy strives to do: conquer- divide- confuse- disguise intentions- don deceptive "favorable" masks appearing to be friend not foe. All tactics taken from Sun Tzu’s Art of War. The enemy we are dealing with is intent on destroying America from within...it's capitalism, its exceptionalism, its power. It is incrementally taking control of it's private property rights, it's water, it's energy supply and it's animal ag industry---America's food supply. They are using many of our influential ag media, and some of our so called "own" to assist in the destruction and collapse of thousands of animal ag producers. By creating a perpetual stream of propaganda fear and suspect about what we do as farmers, ranchers, animal ag producers and the safety of the product we provide these individuals are very, very clever. We've witnessed professional ag journalists repeatedly posting Mercy For Animals videos without verification. We've witnessed self made "experts" in the field of animal welfare emerge... from where? And somehow those individuals know more than the experts in their own field.-the American Farmer/Rancher. With a little research we've watched a pattern emerge disclosing connections and crossings of paths of these so called "animal welfare" experts with long time animal activists. And with a little more research a consistent pattern of animal welfare-food safety fear "consumer concern conjuring" propaganda is reported by our own ag media. We've watched animal activist's ideals enforced with the help of these "experts" result in the demise of thousands of animal ag producers. Follow along as I connect a few more dots. The battle within animal ag is only a sliver of the "big American takeover" picture, the minute portion of the population that produces food for the world. I have been swamped this summer but have much to share and will catch up by first sharing an email from Karen Budd-Falen friend and attorney from Wyoming who has been instrumental in disclosing extremist's deception in EAJA. She is forever fighting for our rights and I hang on every word she says because she is walking the walk and has been victorious in her battles. Since election season is in full swing, I wanted to pass along some things to think about. Feel free to distribute and publish as you see fit. Arthur Lee (1740 - 1792). Under the Fifth Amendment of the U.S.
taken unless there is a public purpose. determine what is in the public purpose. Preservation of their Property. . . .
the fight.” Bob Marley (1945 - 1981). Who Controls Your Family's Future Food Choices? 1. Some fundamental animal activists facts must be understood. a. Animal activists don’t want to compromise; they want to eliminate animal protein from our diets. They want to destroy our ability to produce any animal protein. If their efforts succeed we will not be able to afford to purchase animal protein. b. They have used and will continue to use all avenues to accomplish this. HSUS’100 Point Change Agenda is clear about the means, and they’ve accomplished many on their list. 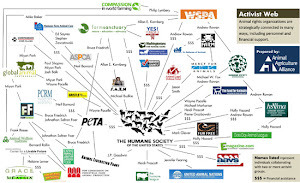 c. They have many deceptive faces as seen in our friend and supporter Animal Ag Alliance's Animal Activist’s Map. d. The victories they’ve had are making it impossible for grassroots animal ag producers to stay in business. Prop 2, Prop B, Horse Slaughter…yes the outcome of all of these affect the other. The change in regulations within each industry is the vision they seek for all animal ag...destroy those industries and their ability to produce animal protein. 2. Decisions are creating unintended (or intended?) consequences. a. Decisions being made by industry affiliate leaders, ag universities, staff, animal scientists, third party auditors and others who have decided to collaborate with animal activists, are creating circumstances detrimental to grassroot’s ability to produce affordable animal protein for our world’s families to consume. b. These decisions have created a conduit for grassroot’s destruction, taking with it our world’s animal protein source. These individuals either realize exactly who they’re dealing with and perhaps may ultimately be benefiting from the collaborations, or they’re out of touch and ignorant about the motives of extreme animal activist and their ultimate goal: to completely eliminate animal protein consumption. c. If animal ag industry leaders, decision makers and others have chosen to align themselves with these extreme animal right’s activist they need to be questioned about their motives. d. Ask yourself...do these leader’s actions align with their industry’s goals and missions? If not, ask questions. What are the motives behind aligning themselves with these extreme animal activists/environmentalists...yes environmentalists because it's all connected? The answer to those questions will either reveal another agenda that supports animal activists or insufficient knowledge about the enemy. When decisions, by individuals who are out of touch with the actual process of raising protein animals for consumption, begin to debilitate and destroy the ability to provide the protein sources God intended for us to consume, grassroots must step up and say something. 3. Education is the key to understanding animal activist’s motives. a. The best resource available is Animal Ag Alliance who has been in the business of defending animal ag against animal activists for over 30 years. b. Every industry affiliate leader and decision maker should be attending the Animal Ag Alliance Stakeholder Summit coming up the first of May. If our animal ag groups are refusing to join forces with Animal Ag Alliance, more questions need answers. Why would any animal ag industry group refuse to hold in high regard this extremely knowledgeable resource? c. If our industry’s leaders, refuse to educate themselves and continue to form alliances with the enemy then new leadership should be put in place. If animal ag scientists join forces with the enemy, their thoughts, attitudes and suggestions should be questioned. d. If ag publication’s articles and animal ag journalist’s thoughts and suggestions align with the enemy, grassroots producers must question those motives as well. These articles are great examples of what is happening to grassroots producers and their ability to economically provide animal protein to a growing population. Is there anymore evidence needed to prove the point that the current path we’re on will take away any chance our children and grandchildren have, of not only being able to purchase and raise animals, but afford to purchase and consume animal protein? We have sustainable agriculture now and have had for centuries. If these groups get their way animal agriculture will not be able to sustain itself; we’ll be regulated out of business. Today will mark the conclusion of my "animal ag producer concerns" case. Most of my thoughts and questions have been penned and I'm nearing the end of gathering information and connecting dots. From this point forward I will build on the issues previously addressed. First of all I want to make one thing clear: animal ag producers and landowners HAVE ALWAYS been concerned about animal welfare and the succession of a productive environment. The proof is in our perpetual existence. Most days animals and land are given precedence over the welfare of farm and ranching family members. This may sound harsh, but it's true and I'm sure other producers would agree. I've aired these concerns from the viewpoint of a 6th generation female rancher. Some of the issues and questions are new, but most of the specific topics covered have bothered and bewildered me for several years. Our family, along with other ranching families, is being bombarded by them daily. Educating and creating public conversation to raise awareness for the protection of fellow family ranchers/ farmers and landowners-Grassroots- was my goal. Hopefully I've stated my thoughts in a logical and understandable way. My concerns manifested after a third party audit took place on our ranch, one performed by a company with a gap in knowledge of the motives of extreme animal activists. That day it became apparent that Grassroots must speak up. The daily battles Grassroots face include, not only, covert and overt attacks by deceitful extreme animal activists and radical environmentalists, but also a smorgasbord of government overreach. We are fortunate to have the NCBA, CBB and other ag organizations working tirelessly to defend us. Somewhere along the way, other burdens have been added to our backs. Certain groups, individuals and companies have jumped on some "extreme pendulum swinging programs" working to satisfy every so-called consumer concern and whim, creating unintended consequences for producers. Consumer studies are clear-the majority of consumers don't want to know how to "make a watch" they merely want to "know the time". They don't want video taped slaughter facilities, or facts on hourly rodent disposal, they simply want to be reassured. Reassured that the food they consume is wholesome, healthy, safe, clean and raised humanely, and to connect a friendly face to that food. In most instances a simple explanation along with a family photo of the place of origin on products at the meat case satisfies consumer concern and curiosity. There are legitimate reasons for audits: a small pocket of elite consumers want more in-depth information about the origin of the food they consume, and certain markets are able to pass on premiums to producers which require third party audits. But I believe anything more... information that obsessively scrutinizes the lives and activities of animal ag producers and processing facilities is playing into the hands of the Extreme. Expensive labor and time intensive protocols for these standards cannot become the norm-the precedence Grassroots must follow to produce products for the majority; a majority base that's predicted to reach 9 billion in the near future. I believe this over-kill research and the scrutinizing of every aspect of animal ag production, by some of our own, is handing Grassroots unintended consequences in the forms of more business-killing regulations. This is causing an out of control snowball affect of increased expenditures for producers. I believe some of the programs being implemented are putting ranchers and landowners at risk for more government overreach by asking that ranch gates be opened wider. I also believe that other monetary alluring producer programs, which ask that specific personalized animal welfare information be handed over for animal activist's scrutiny (and who knows who else), further jeopardizes Grassroots. As I stated earlier: We animal ag producers have ALWAYS held animal and land care above anything else. When specifically did this perception all change? When did The Tail Begin Wagging The Dog? Can a doctor or lawyer's business be understood through outside observation? Neither can outside observers understand the complicated issues facing farmers and ranchers. Decisions being made by good intentioned individuals and groups, some who have little or no knowledge of the processes that create a successful farm or ranch is aiding in the development of these unintended consequences. It's time Grassroot's voices be heard concerning decisions being implemented on our behalf. It's true that we have the opportunity to voice our concerns through membership in our ag organizations, but it has become evident that some of those concerns have been mired by distractions: bureaucracy and friction within some of these groups. The issues needing to be addressed from our standpoint can't wait. They need to be addressed today. So in that effort I will continue to build on the topics that are posted. If issues arise and information comes out that is pertinent to Grassroots, I will post it. Before concluding I want to share a few more thoughts on the carbon sequestration program and Agenda 21. This topic may seem out in left field but the truth is farmers and ranchers in our area were approached several years ago to sign up. I've had many questions about the true motives behind it since. Listen to the link below, peel away a few more layers and come to your own conclusion. I'm vollying again, but it's all connected. Today I'm digging deeper to deflect an attack I spoke about earlier, one I said might cause some toe-stepping; one by a "friend"...or are they foe"? If you've studied Agenda 21 and ICLEI, this group's ultimate goals seem to be to take control of our private property and our lives. And now the toe stepping, which I will apologize for in advance. If someone can explain why a government agency is so determined to push an agenda based on false science, please let me know. Snopes lays the facts on the line...global warming is a fraud; 31,000 scientists can't be wrong. This additional wrap being put in animal ag's noose, whether innocent or premeditated, contributes to our death sentence. Producers before you sign up for anything: educate yourselves, scrutinize and ask questions. Hopefully this is all beginning to make more sense. "Shhh, That's Only Conspiracy Thinking" thoughts are now making their way into mainstream conversations. Those of us whose names have been included in sentences containing "Black Helicopters" are now relieved of that. If you missed Trent Loos'most recent article, here it is Rice and Beans Anyone?. HSUS' infiltration is so far reaching the possibility of ever stopping them seems insurmountable, especially when animal ag producers are unaware of the danger. Raising awareness, garnering knowledge, and possessing courage to speak up are not options for securing the survival of our agriculture heritage, they're a must. Above all else, pray for the survival of our God given rights to continue to own land and raise animals for the world's consumption. This Time Line shows the success animal activists have attained through the years. When The Next Generation Looks Back, What Will They Say About The Decisions We Made On Our Watch? Open The Barn Door Wider, Sleep With the Enemy or Stand and Fight?